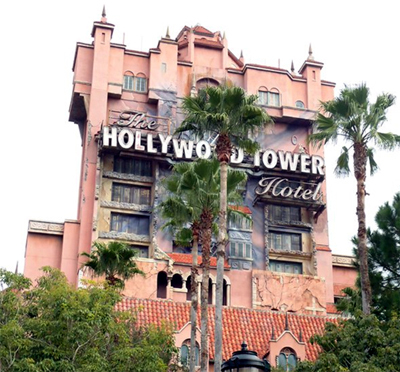 Five Facts: Disney's Tower of Terror! Five Facts: Disney’s Tower of Terror! For those who have read my posts, it is clear that my most favorite Disney attraction is The Twilight Zone Tower of Terror (TOT for short)! Although I have already shared some interesting trivia facts about this ride in a previous post, I couldn’t resist sharing some more! Enjoy! 1. If you ever have looked at the TOT and thought, “That looks like it could be in Morocco!” then you are one smart cookie! Since a portion of the ride can be seen while in the Morocco pavilion at Epcot, Disney Imagineers designed the ride’s exterior to match the Moroccan buildings found in the World Showcase. 2. The TOT is the only hotel to have a 13-diamond AAA award! For all other hotels outside of the Twilight Zone, the highest AAA award is 5 starts. 3. It has been said that from certain angles, the side of TOT resembles Mufasa from The Lion King. Two lights make the lion’s eyes and the towers are his shoulders. Since the TOT was being built around the time the movie came out, it is very possible! 4. The motors used to power the ride’s elevators are 3 times more powerful than those that were used inside the World Trade Center.